At J & A Construction NJ Inc, our professional services include gutter maintenance, installation, and installing rainwater harvesting systems. Our knowledgeable professionals know what it takes to make sure your gutters are the right style for your home and that they are working properly. Need help with your gutters? J & A Construction NJ Inc has over 19 years of experience in the gutter business. Properly maintained gutter systems are crucial in preventing water damage to your home. 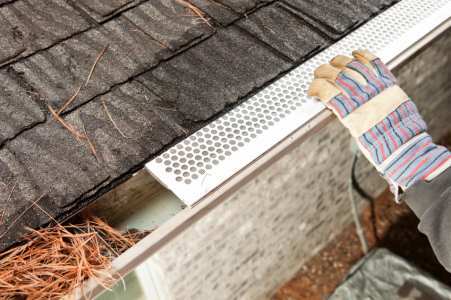 J & A Construction NJ Inc can provide the right gutter maintenance solution for your home. Open aluminum gutters in both standard length and continuous roll-form for seamless installation. Half-round gutters to replace damaged, leaking, or improperly installed gutters. They can accommodate various fascia configurations. Wood gutters, made from cedar or fir. Wood gutters are often required in historic districts because of their authentic look for traditional homes. Copper gutters, that turn a functional part of your home into a design focal point. Heated gutters, lined with a self-regulating heated cable designed to keep your gutters free of ice. No matter what type of gutter system you choose, J & A Construction NJ Inc will make sure your gutters are properly installed to protect your home from water damage for years to come. At J & A Construction NJ Inc, we are committed to providing green solutions that encouraging water conservation. A gutter system is the first step in harvesting rainwater so it can be reused responsibly. Our rainwater harvesting system utilizes your home’s gutters to capture water, then store it in above or below ground tanks. Collected rainwater can be used for landscape irrigation, and decorative fountains or other landscape water features. Reusing rain water helps protect your valuable landscaping when mandatory water bans are enforced. It can also be used as non-potable water for toilet flushing, laundry, car washing, and indoor fire sprinkler systems. Call (201) 371-6061 to find out how you can help save the planet.